As with each of Ms Reisz’s tales, The Queen is a book with a complex web of characters and plot lines, with past and present heavily intertwined. These are not easy, light reads. But damn, are they good. As I’ve mentioned in previous reviews of books in this series, if you haven’t read any of the books, I’d stop reading the review here because there will inevitably be spoilers – not of this book, but of the ones that went before. 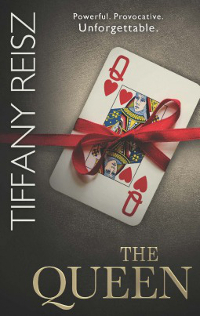 This is another beautifully written tale from Tiffany Reisz. The series is like a jigsaw, really, with each book slotting in more pieces to make the whole picture. With this book, all the pieces are in place and it really makes you appreciate not just The Queen, but all of the other novels, too. It’s a hugely complex world the characters inhabit, and Reisz has told an amazing and very powerful story. Yes, it’s incredibly heavy on the kink, but it’s also laden with emotion, friendships, and all-enduring love. A fantastic ending to a stand-out series. But I suspect this won’t be the last we hear of these characters.